Alpine Skiing, also known as downhill skiing, is a popular sport involving sliding down snow-covered terrain with skis attached to each foot. Alpine skiing is one of two skiing disciplines the other being Nordic skiing. 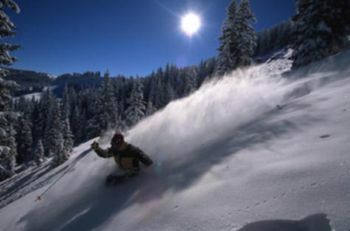 Skiing is a major travelling activity with many enthusiasts, occasionally known as "ski bums," planning entire vacations around skiing at a particular location. Sometimes nearby resorts that can be skied with the same ticket are grouped together. T bar: surface type. Used for low-throughput slopes. Virtually all ski resorts have a ski school where you can sign up for lessons. It's recommended that you learn to ski at a smaller, cheaper mountain nearer to your location before going off to a major ski resort so you won't have to pay a large fee (at least for a skipass) to just use the bunny hill (which would be the same more or less anywhere). There are many types of skiing within alpine skiing, from contests to downhill (going straight without turns) to moguls (going around the bumps). Cross country skiing is usually also available. Nowadays most resorts allow snowboarders as well, but if you plan to do so double check beforehand. Most resorts also offer a variety of other activities such as horseback-riding and ice skating. There are also usually great stores for shopping and wonderful restaurants in the area that are worth looking into after a day of hitting the slopes. Ski resort areas are also frequented during the summer months because of their numerous hiking, mountain bicycling, etc opportunities. If you're not certain of if skiing is right for you or you're travelling a great distance, consider renting your equipment (which should be very easy to do at the resort area). Also consider renting equipment, particularly ski boots, for small children because they will continue to grow and need to change sizes. Cold outdoor equipment (such as heavy jacket, hat, mittens, etc) are a must because of the typically cold conditions--regardless of if you buy or rent your ski equipment.
! Also invest in a good pair of snow pants as you only need to fall once in order to be wet and miserable for the rest of the day should you not have them. Ski goggles and/ or sunglasses are also highly recommended to keep your eyes safe from the glare off the snow. When buying a jacket, make sure its hood fits over the helmet--this is especially important if you ever try skiing on a glacier where weather is colder and winds can be very strong. Skiing takes place in some of the most treacherous terrain in the world under very cold conditions. Be sure you are properly protected against the cold so you will not suffer from frostbite or hypothermia. When you are skiing you will be exposed to the elements all day and need to act accordingly. If you feel particularly cold, particularly if you begin to shiver, call it a day and head indoors to warm up. When the sun comes out, the reflection from the snow around you can cause serious problems as well! Be sure to wear snow goggles or sunglasses to protect your eyes from snowblindness and wear sunscreen to protect yourself from sunburn. Snow can reflect more than 50% of the light that hits it, so wear sunscreen even if it's cloudy outside! You'll thank yourself later. Ski terrain can often be very dangerous and can lead to hazards that can potentially injure or kill a careless skier. Do not ski any terrain that is above your skill level and pay attention to all signs and Ski Patrol instructions. Also heed avalanche warning signs and avoid areas where avalanche buildup can occur. Also always ski in a group or let someone know where you are. If you injure yourself on patrolled terrain, ask a fellow skier to fetch the resort's ski patrol for you. Lift operators can help contact them. Mark the location of an injured person by planting skis or snowboards in an upright cross just uphill. Normally children are accepted to a skiing school from 3 years old. In general, Alpine skiing is not the cheapest of activities. However, as with most travel activities, careful planning ahead can save you a good deal of money. Prices vary greatly among different countries and specific resorts, so make sure to look around. For example, in Europe, resorts in Austria tend to be more expensive than those in neighbouring France. Some resorts have a stronger focus on students or young people than others, which often results in lower average prices and more budget options for accommodation and food. Avoid holidays. Many destinations get crowded during national of even regional holidays and prices tend to rise according to demand. When traveling to another country for your ski-trip, make sure to look up national holidays there. Last minute bookings of course come with the risk of unavailability, but can save up to 30% or more. In many cases, group holidays are cheaper as group accommodations (e.g. 6 or 10 people) are available in many resorts and are often cheaper per person. Check out all-inclusive or at least combined deals, which provide one price for accommodation, rental of equipment and ski-passes. This can be especially interesting if you don't have ski equipment of your own. In some cases, transport (or at least regional transport from the airport or a major train station to the resort) can also be included. In many resorts, apartments are at least as readily available (sometimes even more so) as hotel rooms. If you're on a budget, it often pays of to prepare your own meals. If possible (and not much more expensive), consider accommodation very close to the pistes. It will allow you to head home for lunch instead of being forced to eat out. If you're making your own way to the resort by car, consider taking at least the most expensive foods/ingredients and other supplies with you. Note that many ski resorts are a good drive away from cities or "normal" villages. Supermarkets and shops in the resort (especially in smaller ones) can be rather pricey. If you're renting your equipment, check if your materials are covered under your travel insurance. If not, consider taking an insurance at the spot. Many rental shops offer that option for a rather small fee (e.g. <10 euro in France). It's not at all uncommon for a ski or stick to break and costs of replacement or repair are often high. This page was last edited on 23 December 2017, at 19:56.